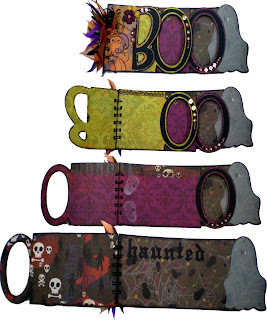 Here is the CUT file for the BOO! Book. I used George and Paper Doll Dress Up cartridges. It is bound using the Bind-it-All. I made this project using the Cricut deep cut blade and housing. Wow! What a difference it makes. 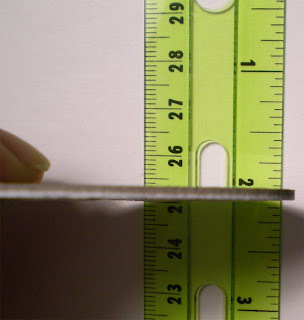 I was able to cut through really heavy chipboard, I think it was about 1/8 " thick. I had tried to cut through this material using the original blade housing and lots of multi-cutting, but with no success. The deep cut did make it through , but it took some learning. The blade housing has 11 depth settings rather than the usual 6. The numbers still say 1 - 6, but you can set it half way between the numbers also. Which means I had to figure out new pressure/blade depth settings. (I feel like I just finally got a handle on the old settings, LOL) I wish I could say it just sliced through like butter on the first try, but it didn't. My first cut came out terrible, I set the pressure at maximum and the blade depth at 6, and the machine stuttered, and made horrible sounds and ugly gashes in the chipboard. So, I decided to try again with all the settings set a little lower. I made my first cut on 4.5 depth and the pressure at high. It cut, but not all the way through. So it is back to multi cutting. I don't usually turn the multicut feature on in the software or my machine, because I forget to turn it off and end up multicutting an innocent piece of thin paper. I usually just press load mat and load last if I am only using my cricut machine, or I just press the cut button again on the software. (no need to press the load mat button when using the software, because it is programed to a specific start point). If you press unload mat do not try to multicut. The cuts won't line up correctly. Only press the load mat button. I found a couple of different cutting patterns made it through. We'll call them Deep Cut recipes. One other thing to watch for when multicutting is stray bits of paper getting caught in the blade housing and blocking the tip of the blade. Wow what a fantastic book. I will be getting myself one of those blades!! !